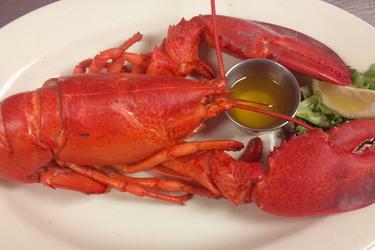 One of the joys of visiting coastal Maine is enjoying a freshly steamed Maine lobster. But what journey does the lobster take from sea to plate? Lobster traps are typically three or four feet long, and are tied with rope to a pot buoy, which traditionally was made of wood but is now most commonly made of Styrofoam or plastic. “Each lobsterman has a different color [buoy],” said Renee Sewall, who has a non-commercial license for five traps. Sewall uses colors that her father used to use: a white buoy with a yellow spindle, with a black stripe and an orange stripe. 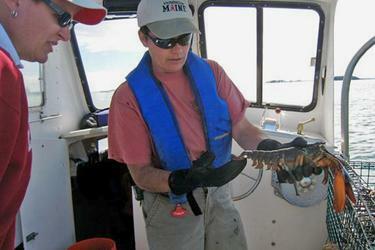 Each trap is baited with a “pocket” or bag, typically stuffed with herring, a lobster favorite. Some lobstermen let their traps “soak” for a day, some for several days. Lobsters crawl in through a funnel into the part of the trap with the bait, called “the kitchen,” said Sewall. Then they go into what’s called the “parlor.” The lobster is then trapped. Sewall shows a friend the tail of a lobster. Female lobsters carrying eggs are illegal to catch—if a fisherman catches a lobster with eggs on it, he should notch the second fin from the right of the tail to signify it is an egg-carrying female. V-notch lobsters are thrown back. 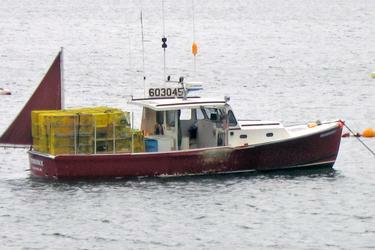 Lobstermen who fish commercially then bring their lobster to a dealer or to a co-op, where it is purchased from them. Lobster is bought by weight, just as it’s sold by the pound to consumers. Lobsters are unloaded from the tanks into crates. 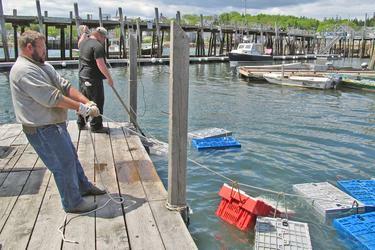 Once the crates are full, the crates are then put on a line off the float, so that the lobsters are in the water. Pictured is Stonington Co-op employee Brad Eaton putting a crate on the line. The next day, the crates will be put onto trucks, said co-op manager Ronnie Trundy. The lobster is purchased and shipped to Hancock, where it is graded according to lobster health, hardness of shell, and size. 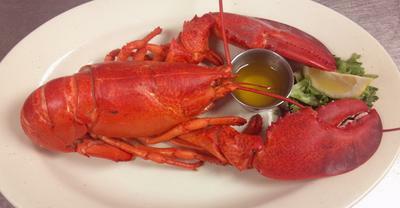 The lobster is then trucked to restaurants, shipped to grocery stores and air-freighted around the country. And that’s how, in one of the many area restaurants, you’ll find a steamed Maine lobster (often accompanied by the classic corn on the cob and steamers).